The Rescue Your Videotapes! first steps – with crystal clear explanations. The tutorial videos provide you with important tips & tricks about all program functions. It's the fastest way to digitize your own videos! 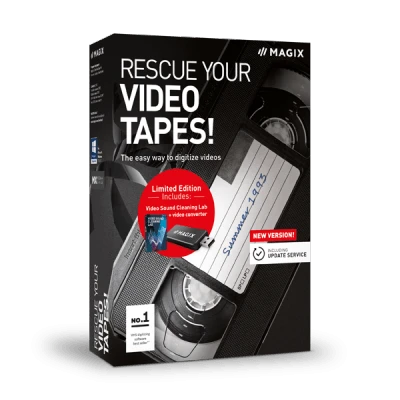 This short introductory video shows you how easy it is to connect your VHS recorder to your computer using the hardware included with MAGIX Rescue Your Videotapes! We'll also show you how recording videotapes in the included software works and how to edit your footage afterwards. Always in touch with the latest trends: The MAGIX Magazine keeps you up to date with the latest news and stories about trends in music, film, photography, graphics and the web. All articles are written by MAGIX employees. It pays off to check the MAGIX Magazine regularly – we recommend bookmarking it right away magazine.magix.com. The MAGIX Multimedia Community is the place for current discussions on Web design, photo editing, video editing and music production. The core of this portal is the mutual exchange of creative works, program features, and tips & tricks. Join the Multimedia Community now: www.magix.info.